The Envestnet Advisor Portal gives you the tools to conquer complexity and drive your success through integrated portfolio, practice management, and reporting solutions. 28 of the 50 leading banks* use Envestnet to help design, develop, and deploy a more profitable operating model for managing their client’s retail, high-net-worth, and institutional businesses. Whether you advise clients, manage portfolios, oversee client relationships, coordinate trust services, or develop new business, you face increasingly complex demands to advise and serve your clients, while at the same time to grow your business and effectively manage risks. I spend too much time toggling among different tools and systems to manage my client portfolios. With Envestnet, you can leverage a single, integrated platform to manage every step of the wealth management process. The Envestnet Advisor Portal delivers practice and administrative tools that include: portfolio analytics, proposal generation, rebalancing, billing, and aggregated reporting. You can also access more than 15,000 investment products and institutional quality insight that can help you more effectively provide context to the advice you give clients. My clients expect me to deliver clear and comprehensive updates on their progress towards their financial goals and objectives. 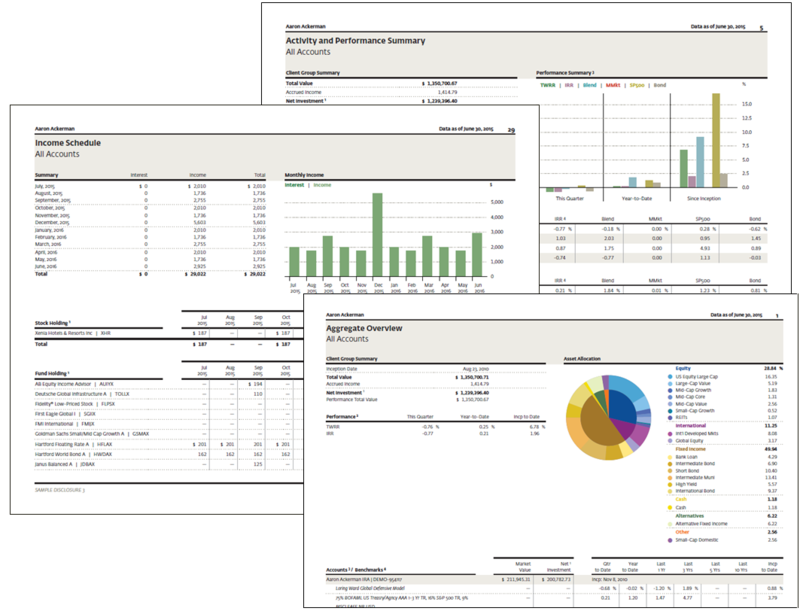 With our customizable performance and investment policy reports, you can tailor the information you provide to clients that highlight their progress toward their investment goals. Use standard time periods or create custom timeframes that are meaningful to them. Information from multiple custodians can be combined, analyzed, and presented as a single, comprehensive portfolio and branded with your logo. I find it difficult to provide complete advice without visibility into my clients’ entire financial landscape. With Envestnet’s integrated wealth management platform, you can include held-away assets along with those managed on the platform, and gain a complete picture of your clients’ wealth. Present a single, overall view in real time and deliver truly holistic advice to your clients based on a clear and comprehensive view of their entire wealth. I am required to ensure and explain how my clients’ portfolios adhere to established firm compliance rules and regulatory requirements. Maintain investment policy rules and set up alerts that include built-in guardrails to help you stay within your fiduciary responsibilities. Our Investment Policy Exceptions dashboard help explain the compliance implications of decisions you make. Use them to record the reasoning behind actions you take on behalf of clients and provide an added layer of transparency. Investment presentations delivered to prospects are pieced together manually. You can create powerful investment proposals that give prospects a complete analysis of their wealth through our robust proposal generator system. Proposal documents are generated and downloadable online and can include colorful graphics and be labeled with your branding. Bank launches scalable portfolio management that employs a more consistent philosophy and investment process with a combination of internal and external managers. With Envestnet, you can build personalized, holistic investment proposals that incorporate all of a client's assets, including those in accounts that may be managed elsewhere. Deliver a professional presentation branded with your logo. Trading tools enable scalable execution of your investment advice as well as the ability to manage to each client’s specific investment policy. Our performance reports are completely customizable, and can include growth targets, tax estimates, and custom time periods as well as more standard performance measures. Build comprehensive investment proposals that generates new account paperwork to facilitate opening accounts at the custodians. Generate an asset analysis and build effective investment proposals that compare the current allocation to a target allocation. Access professional performance reports that include an aggregate overview, income schedule, and much more.